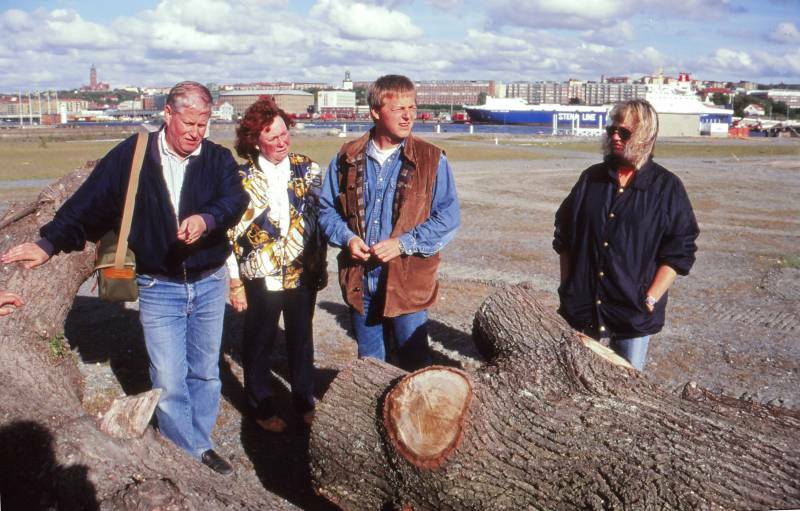 This is the first winter of the project and immediately after the Boat Fair at Svenska Mässan, early 1993. 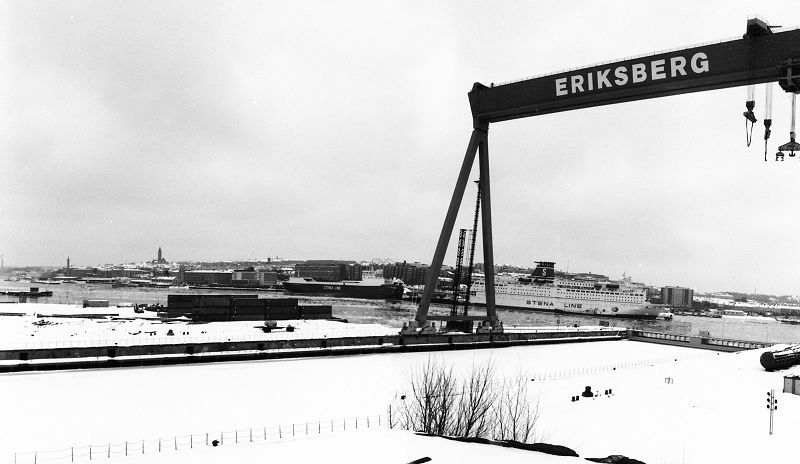 The former Eriksbergs shipyard, where we will build our East Indiaman Gotheborg III is covered in snow. The large white area under the crane is actually an ice covered dock. Near the river are a set of steel containers, left there after a theater project. That is where our shipyard building would go. Never - I though when I took this picture - will our East Indiaman feel further away than this. This was the absolute bare beginning. The absolute zero. But not really, we had the plot now. Photo © Jan-Erik Nilsson, February 1993. 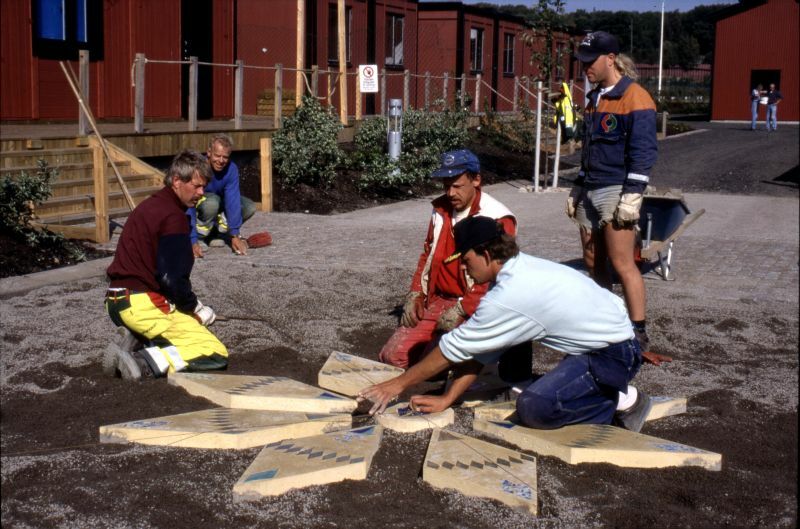 In late 1993 the Project Management Board have started to have our meetings in an old house called Skateberg, at Lindholmen. The chairman was the most respected Erik Wettergren. There we had weekly meetings to report how things were going for each of us. The routine gave a framework to the project even if we lacked pretty much everything. At this stage it was mostly Anders who traveled around and had meetings with groups of people and posible sponsors. This day Anders had interesting news. He had just met with Bengt Tengroth, who at this time was heading Eriksbergs Förvaltnings AB and from him secured the rights to use a piece of land at the old Eriksbergs shipyard area. Eventually there would be houses built there but in the meantime we are welcome to build our ship there. We think we will be pretty much done by year 2000 and that is OK with him. The rent will be 100 SEK (c. 10 Euro) per year and a promise, that when the ship is built it will have its home harbor on the Eriksbergs side of the Göta River. Upon which the agreement is made. After the meeting at Skateberg Anders drove us both there in his trusty old Toyota van, so we could take a look and get used to the idea. The snow would melt away, and the plot was well located in the middle of the city, making it easy for the public to access it. 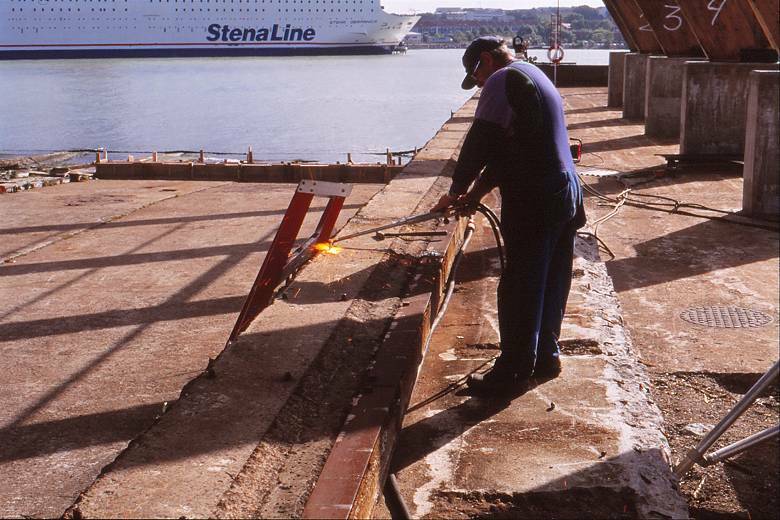 There is a difference between a shipyard for building ships and for repairing them. This had its old launch slip #6 left from the old Eriksberg Shipyard, which would be the right thing for us, that we needed to launch our ship from. We could not have found a better spot. Never, I though when I took this picture, will our East Indiaman Gotheborg feel further away than this. In my minds eye, I could already see the wooden ribs of the hull sticking up against the snow gray sky down there, near the black row of containers, left there from a theater project. I also remember that I had no doubt at all about the we could do it. Personally I thought finding a place to build the shipyard on would be the most difficult part of the whole thing. I had been thinking about much further up the river but realize now that the water would have been too shallow. This was more than perfect. Now, there would be just a few practical things to sort out. 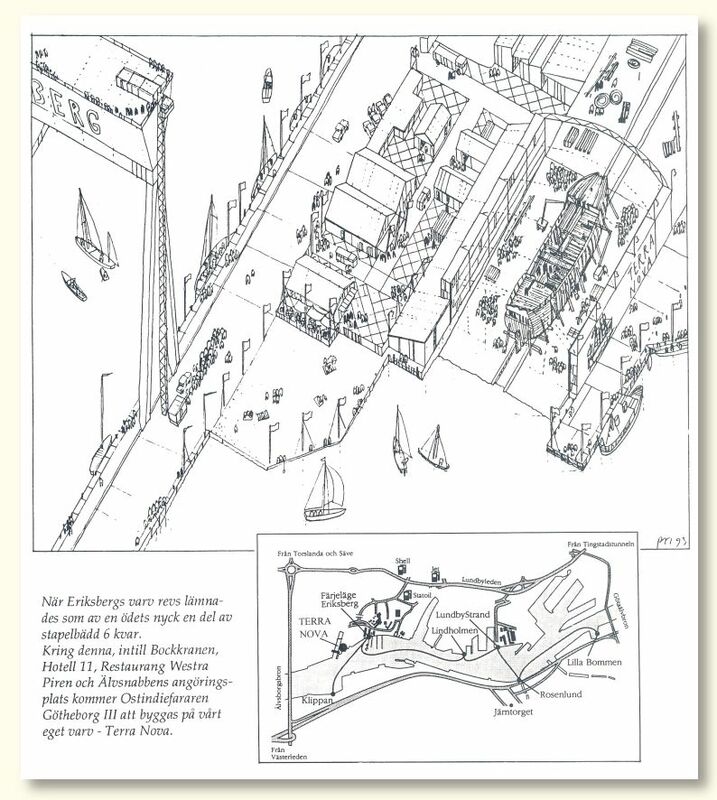 The plan for how the actual shipyard would look and function with all aspects of logistics for building, workforce, material, electricity, plumbing and dividing the area for both public and work was the result of joint efforts between the former shipyard engineer Gunnar Angert and Anders. The plan was presented in the following drawing. This is so early that we are still thinking about using the left over containers as walls for the shipyard hall. 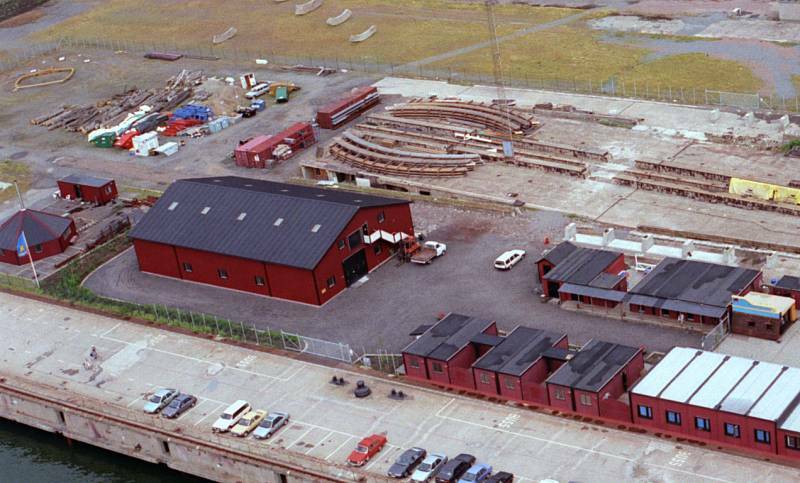 Early in 1993 the Shipyard Terra Nova is planned by Anders Wästfelt and Gunnar Angert. Anders Wästfelt is focusing on how the sponsors receptions and the public will be given an opportunity to follow the building of the ship while Gunnar Angert, is concentrating on the systems necessary for the logistics and the building of the ship. 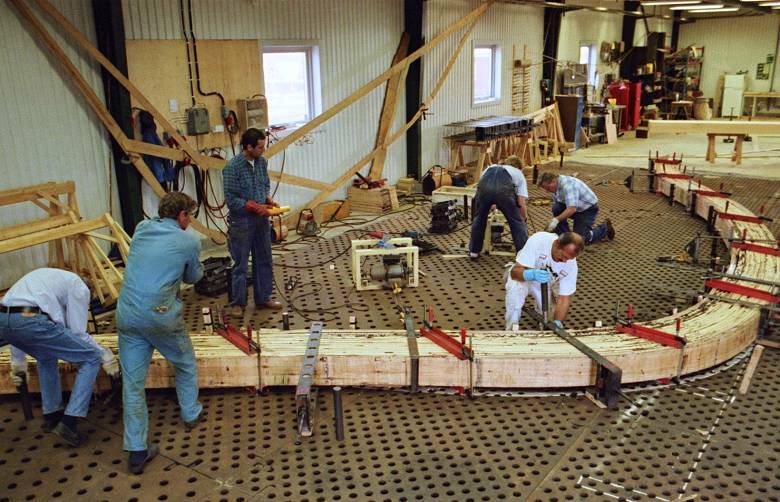 Terra Nova Shipyard, summer of 1993. Here we would build the shipyard. The company SOIC AB and the Foundation was not yet founded. We were firmly determined that on this muddy piece of industrial wasteland we would build a ship that would sail to China. But, first we needed a shipyard. 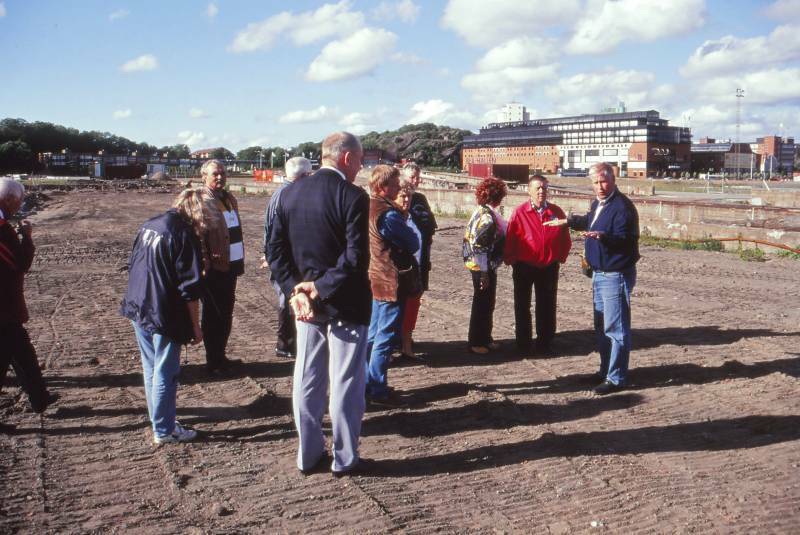 To the right, Anders Wästfelt describing the layout of the shipyard and where the various buildings were to be erected. Anders (right) explaining where things are to stand. In the foreground with his back to the camera, Bo Alfredsson. 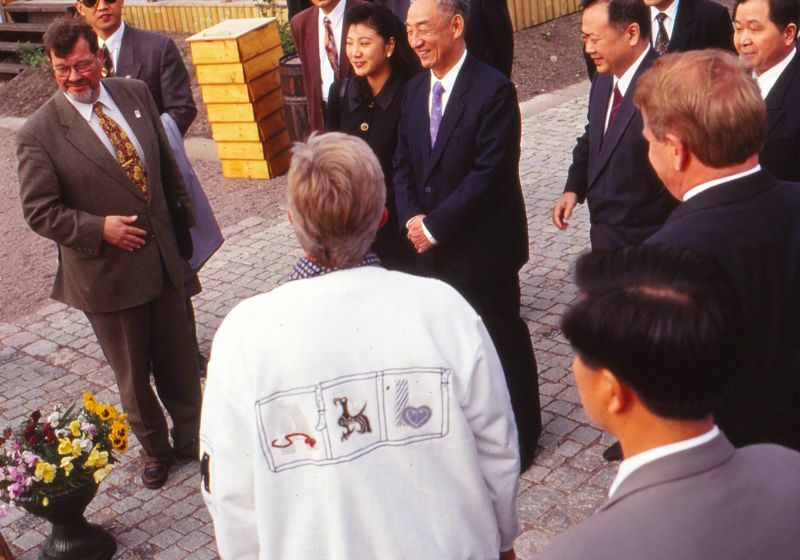 Behind him in white hair is Erik Wettergren, chairman of the Management Group and eventually the first CEO of SOIC AB. Stepping into the picture from the left is Axel Miltander, collectors editor at GP. Oak quality discussions. Even before the first buildings are erected on the shipyard plot the first oak trees have arrived. The consistent problem is that most oaks have grown too fast and have internal flaws that you don't see before they have been cut down. 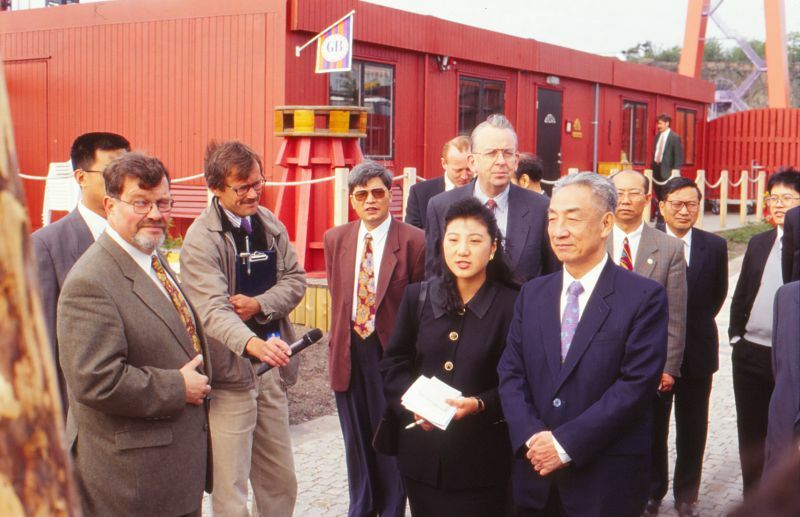 Later same year, the Chairman of the Chinese People's Congress, Mr. Li Ruihan inaugurate the Terra Nova shipyard area. The Terra Nova Shipyard is rapidly developed and kept very neat to be a good showing ground for Sponsors. Before the actual ship could be built, what is to be shown is mostly an ambition that however needs to be very clear, very determined and very convincing. To provide a dry and comfortable route to the lecture hall, a small roof is built over the causeway leading from the entrance office around the building. Causeway from the lecture hall exit towards the office. In the far distance to the left is the starting point for all viewings of the shipyard, Lars Gillis' mural painting of the harbour entrance from the place where you would stand in front of the painting. As it looked in 1996. 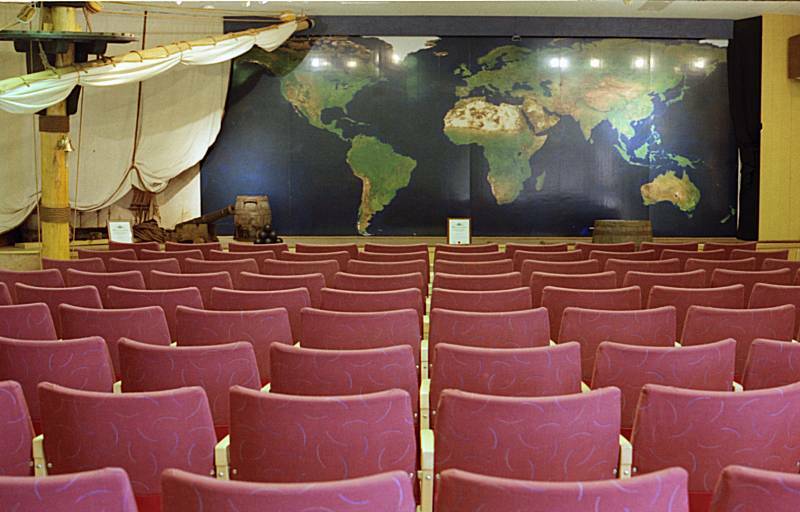 Five of the sections were higher than the normal ones and was combined into one large room with a stage in one end, and fitted with old movie theater chairs that could seat 100 persons. The cloth used to reupholster the old chairs was donated to the project. This area properly used would pay for the whole project. 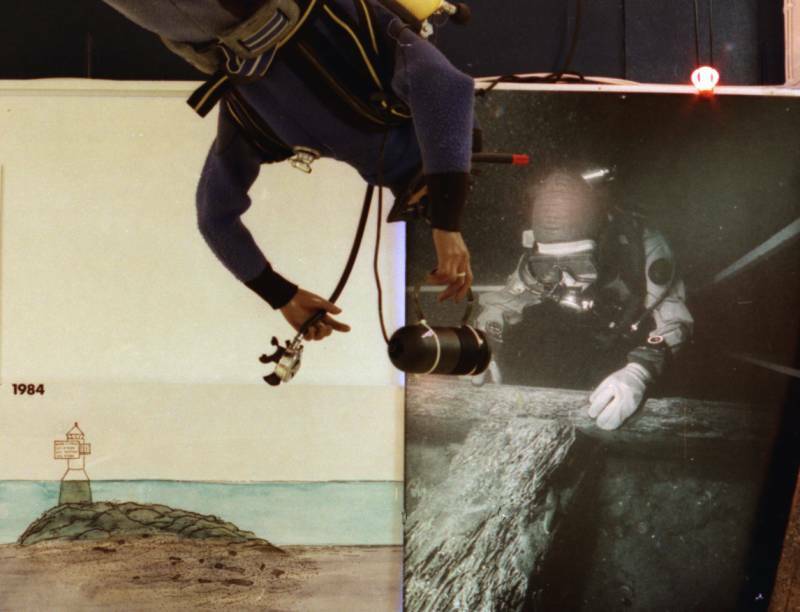 After 1998 this exhibition was removed. The stage was decorated with some props - mast, sail and a small salute canon and some of the actual cannon balls that was cast for us to the ships canons. In the background, a huge composite satellite photo of the planet earth seen from space, with no borders. We used this instead if a map when we were detailing the sailing route and explaining world history and connecting dots. The same satellite photo and a number of close-up's - one per destination - was used on our first Internet project website for the 'virtual tour' exhibition. The exhibition was organized in chronological order, beginning with the founding of the Swedish East India Company in 1731, followed by how the company made money and what they traded in and the last voyage of the Götheborg in 1743-45. On the opposite wall the story continued with the gradual destruction of the Gotheborg ship wreck over the centuries and its final excavation in 1985-1992. After the lecture we would finish with explaining that now we are going to build a replica, go to China again and continue where we left off in 1813, and we'll all be silly rich again. This is the Terra Nova Shipyard as it actually looked like after the keel had been laid but before the ships hall had been erected. A lot of effort went into making the shipyard look attractive to possible sponsors. The only thing we had going for us at this time was endless amounts of goodwill from the excavation period, a mind boggling idea, hundreds of helping hands, hundreds of thousands of interested spectators, and a keel. And a really nice shipyard. The Shipyard Terra Nova. At this time the keel is in place, in part covered by the yellow tarpaulin on the slip way. All office buildings are made up by standard workplace modules, lent to us by Skanska Cement AB at no costs. The land surfaces were set in order by Eriksbergs Förvaltnings AB from whom we rented the area that was now also surrounded by a fence. 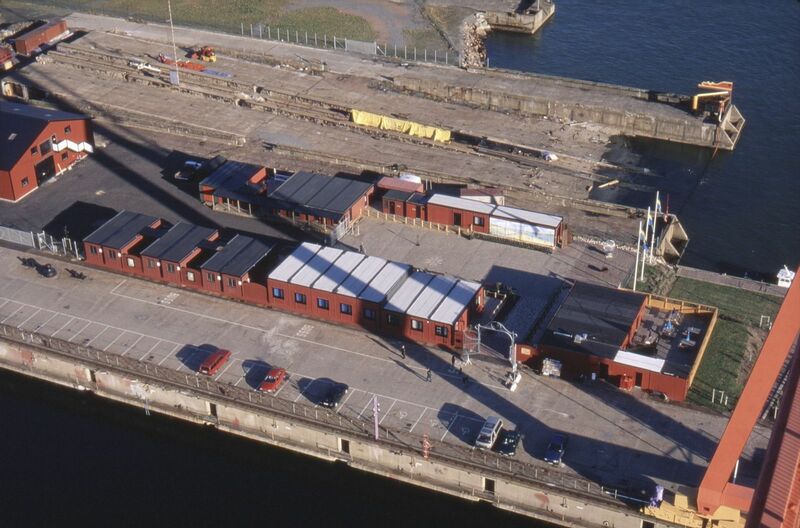 The red module in the foreground with the terrace and the chairs is the shipyard café. 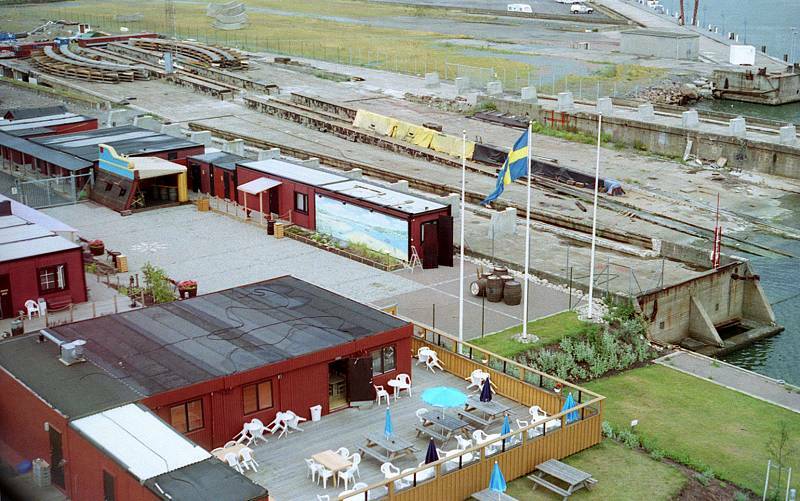 The building to the immediate left of which we can only see a corner, is the ticket office and administrative building where Anders Wästfelt, Berit and I was sitting. 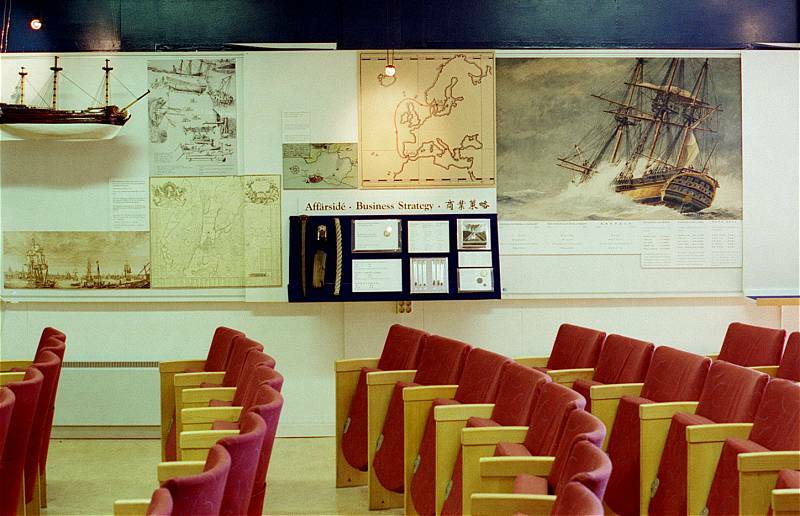 Inside this module came a small conference room and eventually a lecture hall with a permanent exhibition outlining the historical background of the project. At the far end of that row were the three modules for the ship's construction and design team. 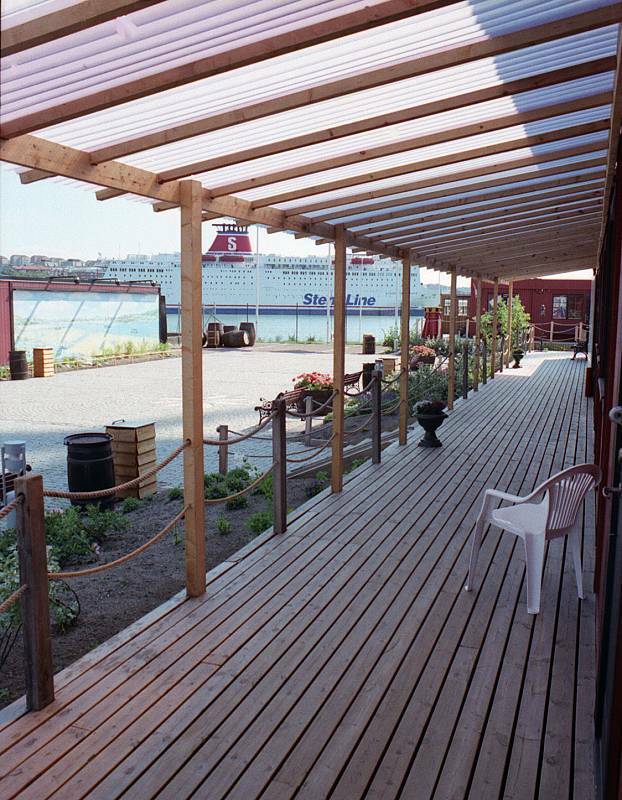 The café was kept open by Eva from the very beginning of the shipyard activities and was a much appreciated resting place during the cold seasons of first years, when there were not really that much guests. 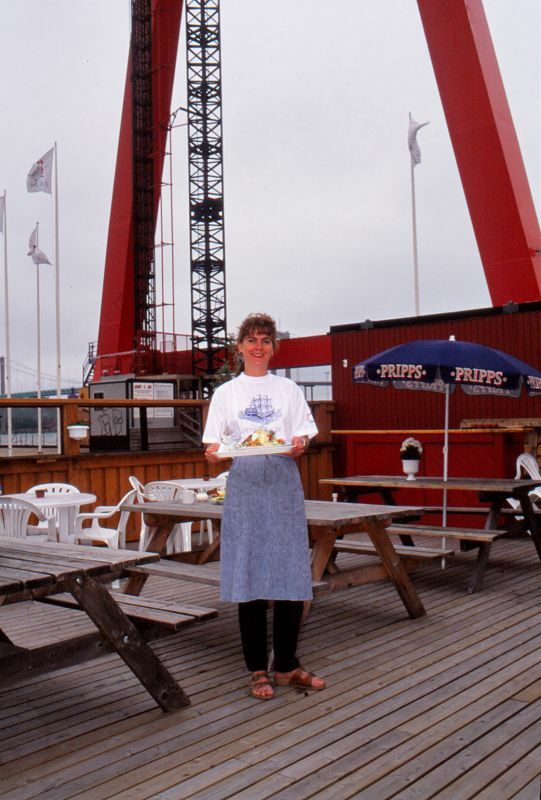 The 'Café Nova' was run by Eva Carlsson and planned to become a part of the Shipyard attractions. 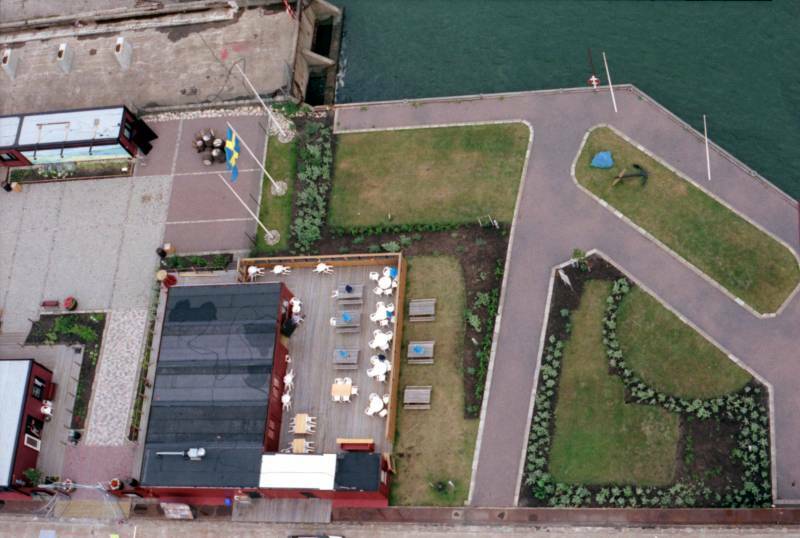 It was integrated with the Shipyard to the immediate right of the main entrance opposite the reception and overlooking the 'Chinese Garden'. 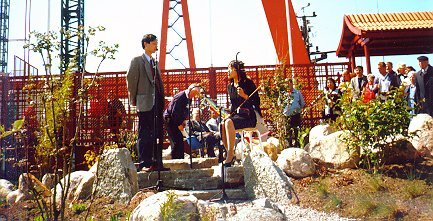 In 1997 the Chinese Garden next to the Shipyards area is inaugurated. In a unique ceremony the "Chinese Garden" was inaugurated by the Chinese Consul-General to Gothenburg Mr. Tan Jialun and our CEO tying together two bands instead of cutting one. This was later the official landing place when Queen Silvia officially visited the Shipyard a while later. This was created because there was a stone there that could be painted, and because that on the other side of the Göta River is another stone that traditionally are kept painted r e d since time immemorable. 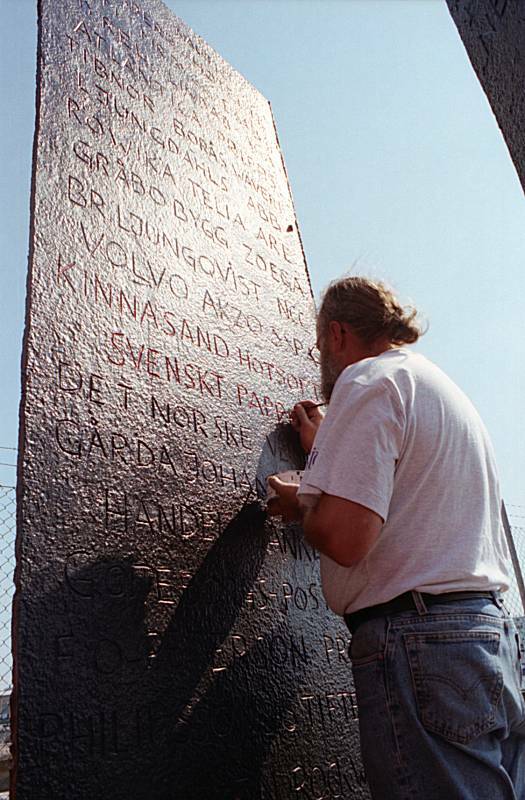 It is thought that the red stone is either a war memorial mark or mark the official beginning of the Gothenburg harbor. Our Blue Stone's purpose was mostly to be blue - in the bargain we got a simple reference point for the shipyards landing point from the sea. The green area in front of the flagpoles is to become our Chinese Garden. Near the garden was also a 'blue stone', where the Order of Colldin planted a cross at a ceremony the 18th of August 1997. On the gravel near the flagpoles are a set of whiskey barrels that was brought here from Scotland as decoration. At least one of them was said to have had about half a liter of whisky sloshing around in it when opened. This is because of the oak in the barrels are completely drenched in whiskey when the barrel is full. After it has been emptied the whiskey slowly seeps out. Which was unceremoniously poured out. They said. 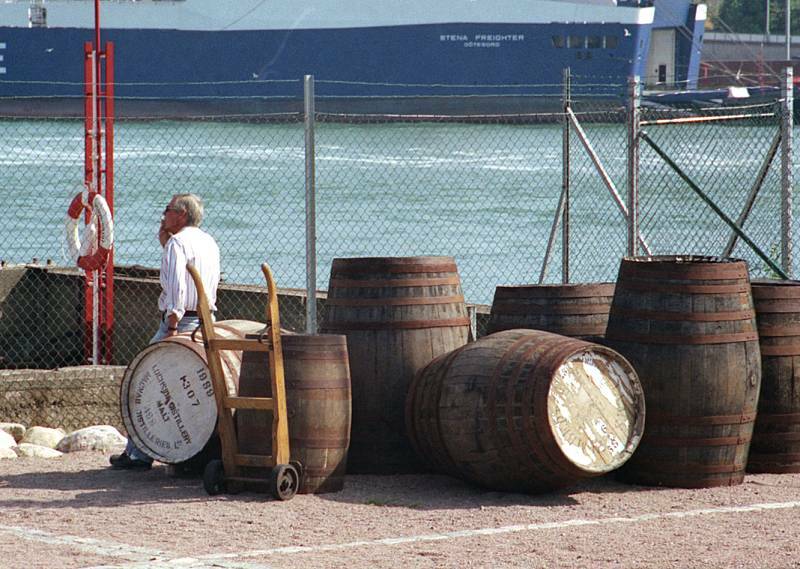 Nils Boijart of the exhibition group, and a set of whiskey barrels brought here from Scotland as decoration. Behind the barrels as seen in the aerial view, there are two dark objects looking like doors. That is actually two large pieces of ship's hull iron sheets which was found on the area and was erected here to be engraved with the name of the sponsor's we had this far. here engraved in a ships iron sheet found on the site when we were cleaning it up ahead of the project. Behind these iron sheets, following the length of the slip bed are first the 'souvenir shop' and on the outside of this, facing the courtyard, is a large mural painted for us by Lars Gillis. At this time there were not that many souvenirs to sell, and not that many visitors to sell anything to either. This was however our main source of gifts to the various delegations that came to visit us. Mostly some books, tea bags, some silk items and bits and pieces left over from previous exhibitions. In the autumn this year we would receive a very interesting addition to the ship's equipment. A set of cannons, cast to the original specifications by Daros Piston Rings AB and donated to the project. The story as the CEO explained to me was they knew it was a bit early since there were no ship around yet, but that they in 1999 would move to a new plant and with the equipment available there they would not be able to cast such objects as canons so, if it was ok with us they would cast and deliver the canons we would need already now. They would be made one at a time on overtime and that the guys back at the factory was quite amused by the prospect of helping out. 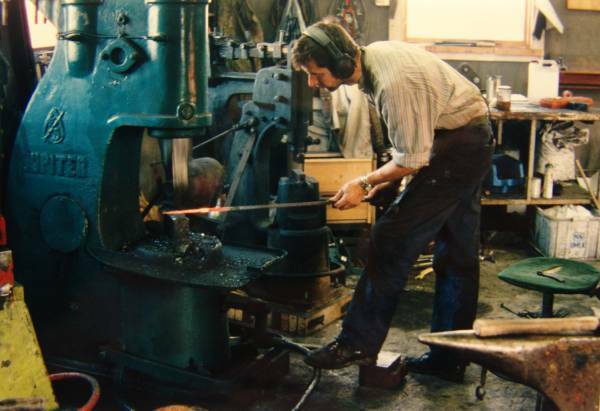 The original founder of DAROS was also one of the men of Scottish descent that helped industrialize Sweden at the end of the 18th century so the connection was a natural one. When it came to deliver the canons to the Shipyard I suggested that we should call the Western Naval Command which was the local Navy outfit, located near the harbor outlet. They should be the right people to handle Ship's cannons. They were delighted to help. Outdated or not, this was the kind of work they lived for. 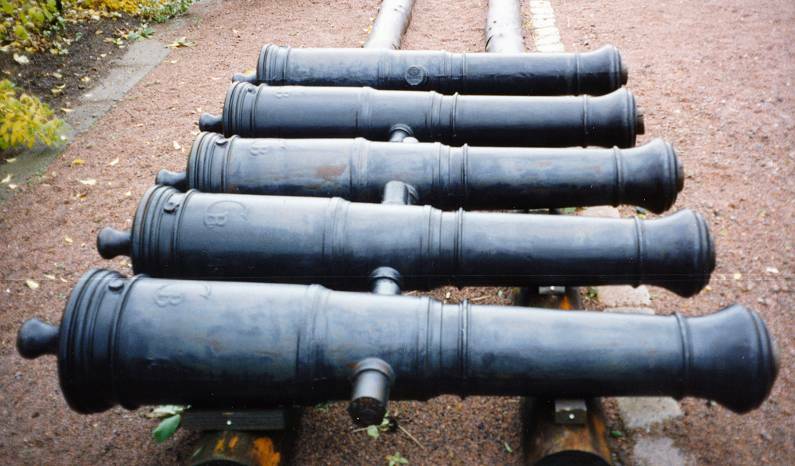 The 16 reconstructed 6 lbs cannons on the East Indiaman Gotheborg was cast by DAROS in 1996 in support of the project. When the ship building would get under way it was expected that the number of visitors would increase and a souvenir shop would be a good source of income. 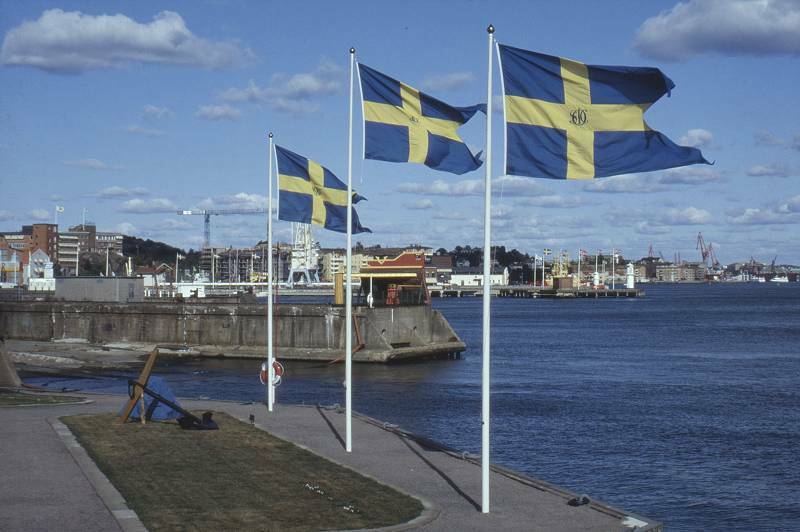 During the build up period, most of the visitors was either groups that was already sponsoring the project or official visits to the city of Gothenburg. 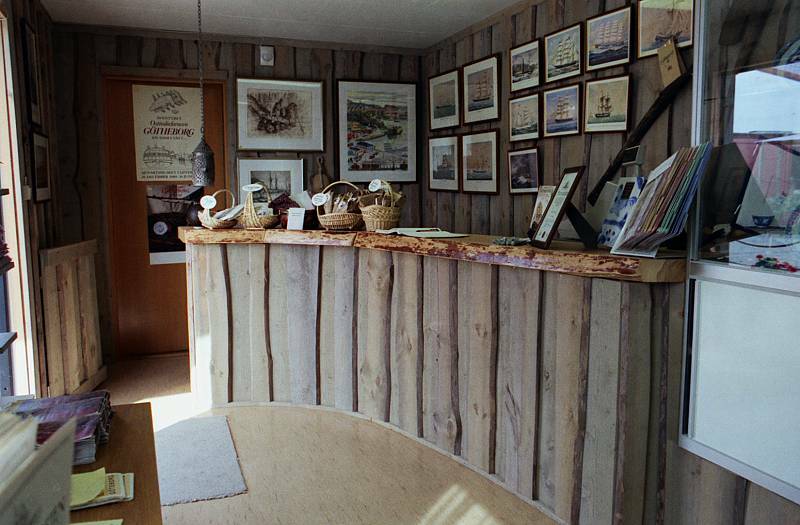 During the first years the shop was mostly for show and a source for gifts that we needed to give our official visitors. A popular gift with us was to hand out "tickets" for this or that stretch of the sailing route. Next in this row of buildings came rest rooms for visitors, the guides offices, and next a set of dressing rooms and wardrobes for the shipyard volunteers and workforce. The structure with the blue roof facade is our ship midsection model in 1:1 scale with a canon replica and a ship's hammock. This was extensively used to demonstrate the look and feel of the forthcoming ships interior. Ship midsection model. The first year the number of drop-in visitors was very limited and most visitors arrived as groups. In the center Shipyard guide Karin Mojzis, to the right Nils Boijart, from the exhibition group. Ship midsection model in 1:1 scale. Further in behind the canon was a ship's hammock. Here at the end of the stone set yard was also a fence that cut off the public area from the production area, an arrangement both for security and convenience. This way it was much easier to hold the visiting groups together while at the same time disturb the production as little as possible. Looking at both sides of the slip way there are now eleven plinths cast in reinforced concrete on each side and finally top left, there are large piles of beams that are to form the roof over the ships hall. The beams came from an old building in Skandiahamnen and was donated to us by the Gothenburg Harbour AB. The covering of the hall with a tin roof, we eventually needed to contract and pay for though, but the rest was sponsored. The reality of things was that there was really very little cash money to go around. Besides ourselves in leading positions, there were another large group of volunteers who came and went as they pleased but without whose help we would have been stumped. Another large supplier of helping hands was Länsarbetsnämnden who had accepted us as a workplace to which they could send paid help towards that we could provide a workplace and something to do. This turned out to be a veritable gold mine of talent. That you don't really fit in the 20th century streamlined production does not mean that you don't fit right in, in an 18th century trade and shipping company. Professor of History Jörgen Weibull and Alf Österström, Priest of the local congregation. 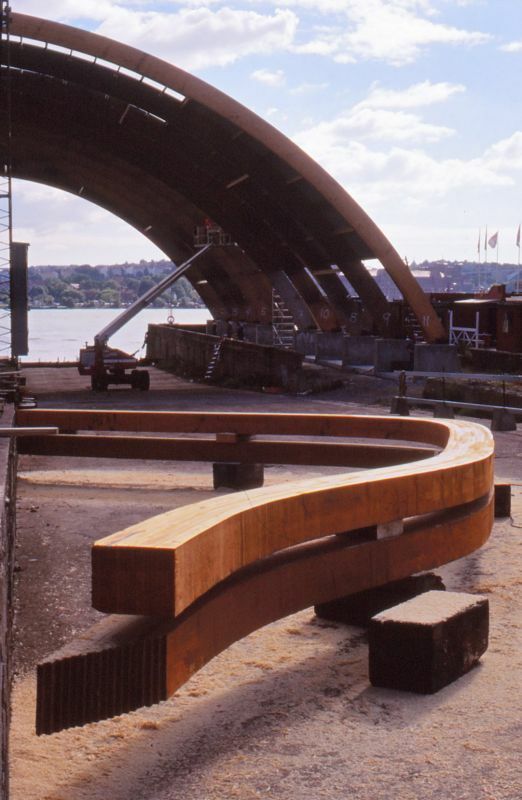 Two coins are placed in each of the two joints of the 33 meter long oak keel. In the Rib workshop the ribs to the Gotheborg III was made. 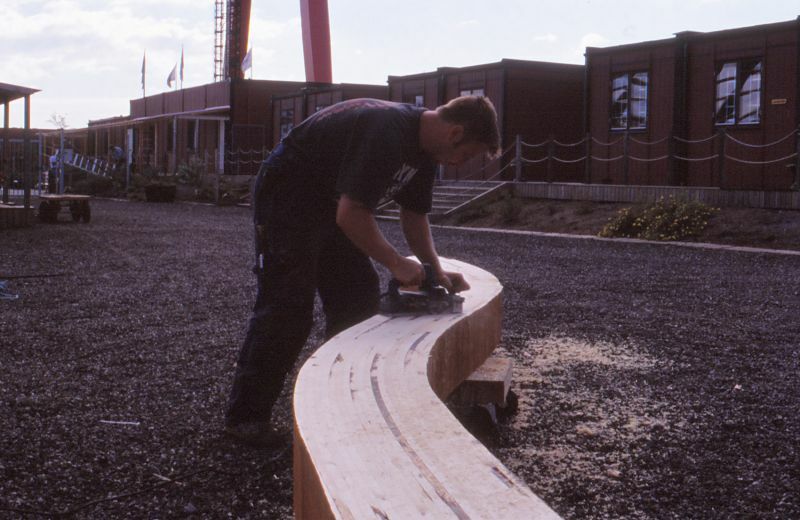 Originally naturally grown oaks would have been used for the different parts of the ship's hull but for our purpose we would use bent and glued pinewood planks made to very exacting specification. In this way the ribs to our ship would be many times stronger than the original ones in massive oak. Initially this was much discussed since the overly strong ribs could be used to put them further apart and use less ribs than the original. This was decided against since that would effect the authenticity. Besides, we liked the extra strength for safety concerns. Another concern was if the glue would withstand possible moist and water for years to come. A lot of thought went into looking into this aspect and for this, the best possible glue was used. The ribs were made in separate left and right halves that was bolted together with two keel sections. All tools and methods for this work was developed by our own people. Ribs being made one half at a time. Two identical was made at a time and at the time of fastening to the hull, bolted together. All tools and methods for this work was made and developed on the shipyard. Rib shaping by hand force and small electric winches that would be used to pull the stack of pine wood planks into its set shape. 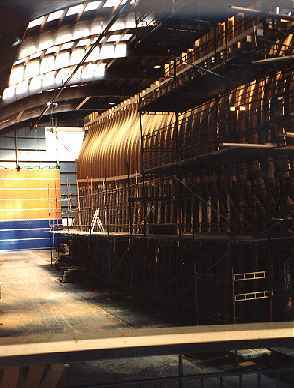 The curve to follow for each set of ribs is painted in white on the floor. 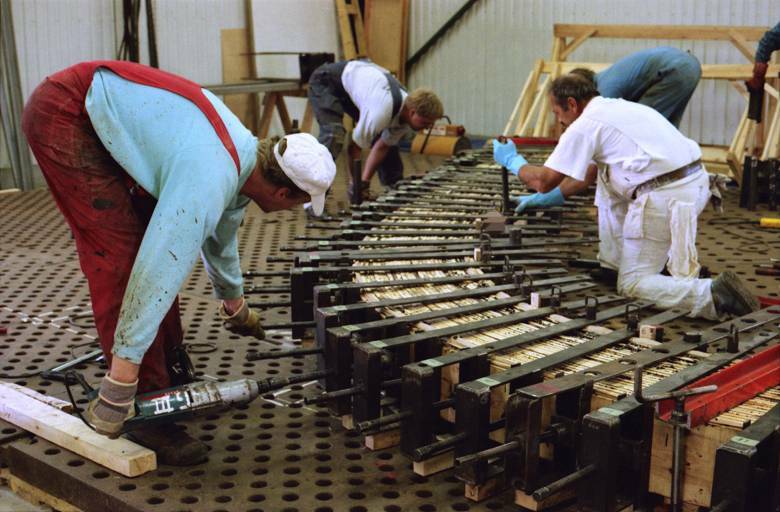 Before being erected onto the keel, the ribs were sanded to even out the sides. 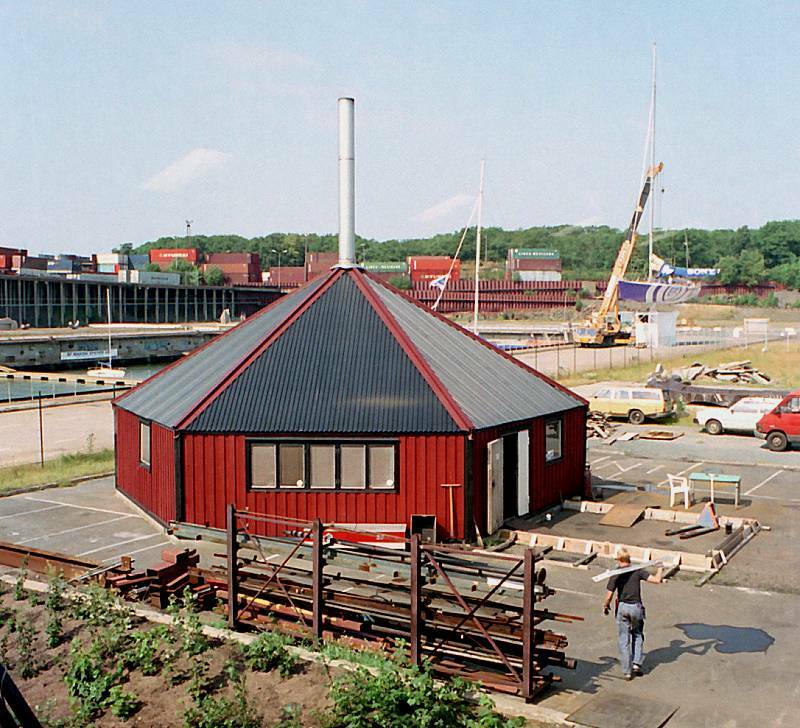 In 1996, the shipyard hall is erected. The shipyard building with two of the first ribs. In the cement alongside the old slip were some iron rods that were unnecessary and removed. 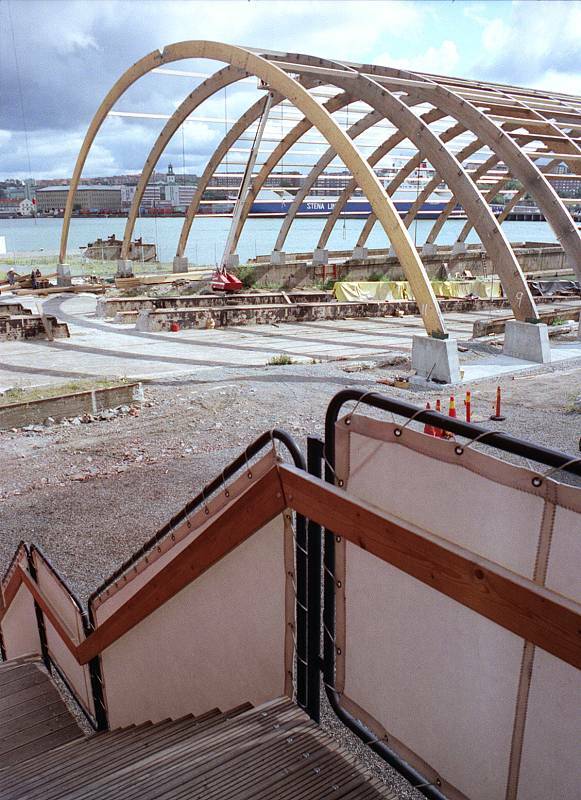 In 1996 the main shipyard hall is covered and the project is finally well under way. The ships ribs are made and are erected one by one. Of a budgeted grand total of SEK 100 millions, some SEK 15 millions had been found and spent at making preparations, drawings, plans and building a small but adequate shipyard. Of this the 'Friends' Organization has donated over 1 million SEK. The former Eriksberg AB shipyard manager, Erkki Person was brought into the project by Bengt Tengroth and appointed CEO (Chief Executive Officer) for Terra Nova, bringing with him knowledge of the real, modern, Swedish shipbuilding industry. The Sail makers Loft was located on a second floor, on top of the rib workshop. Well in advance and long before there were even a trace of a mast to put a sail on, a rigging group were organized and working with sail stitching research, education and training. The Master Blacksmith Berth Johansson established for the project a smithy where 50-60 tons of iron over the years were transformed into nails, bolts and all kinds of special fittings and tools needed for the ship and its rigging. The masterpiece was the anchor of the ship. Tongs used to transport the work pieces to and from the forge, and also to hold the work piece on the anvil. When done the work piece is cooled down in a 'slack tub' filled with water. 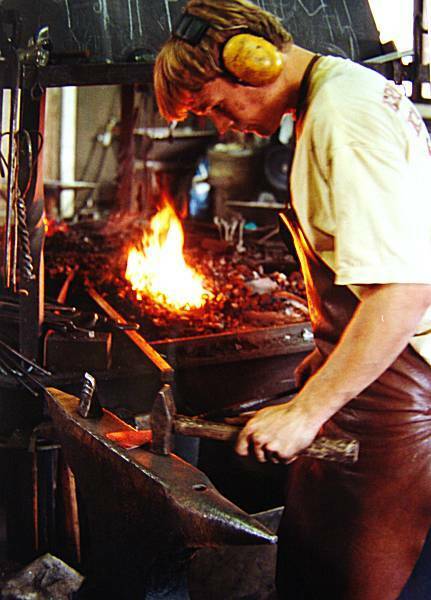 A forge is a hearth used for heating metals, or the workplace ("smithy") where the hearth is located. 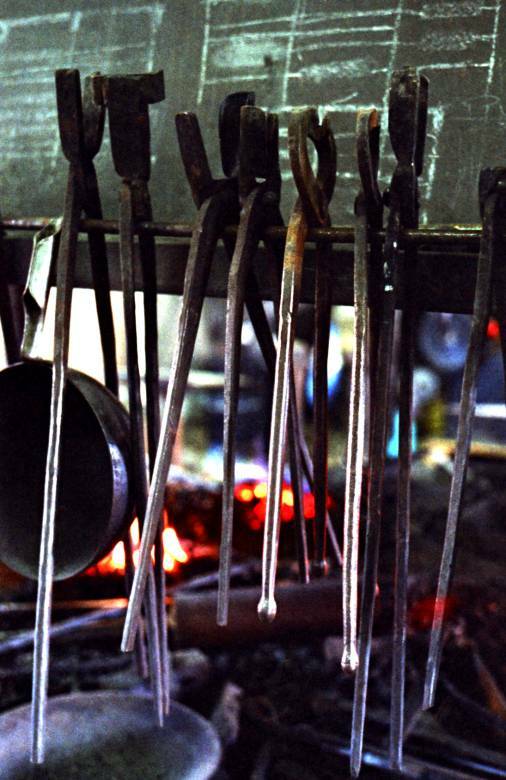 The forge is used by the smith to heat a piece of metal to a temperature where it becomes easier to shape, or to the point where work hardening no longer occurs. Every single piece of iron from nail to anchor was hand made on the shipyard. Not one of the pieces needed for the hull or the rigging would have been available over the counter anywhere in the world. 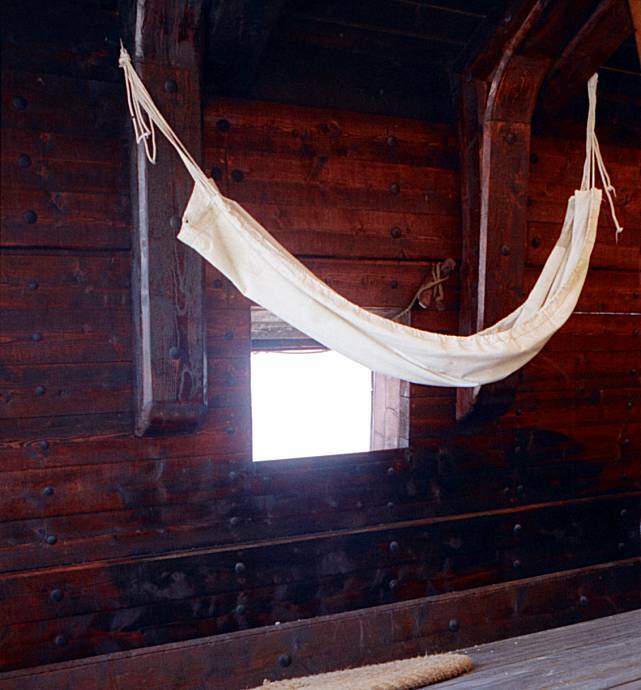 The Ship's interior was designed by the Ship's Interior Designer Roland Rydén. He started in the project in 1994 and had worked with Ships Interior design during his entire life. The Office and Lecture Hall was built by combining five, plus six house modules combined in pairs, first borrowed or rented from by Skanska AB then eventually donated to the project. The three pair buildings was used for construction and meeting. My own office was initially in the third module, adjacent to the lecture hall, after which I moved to the reception area. The actual hull would be constructed on the old Eriksbergs shipyard launch slip # 6 that was conveniently left in place awaiting our project. 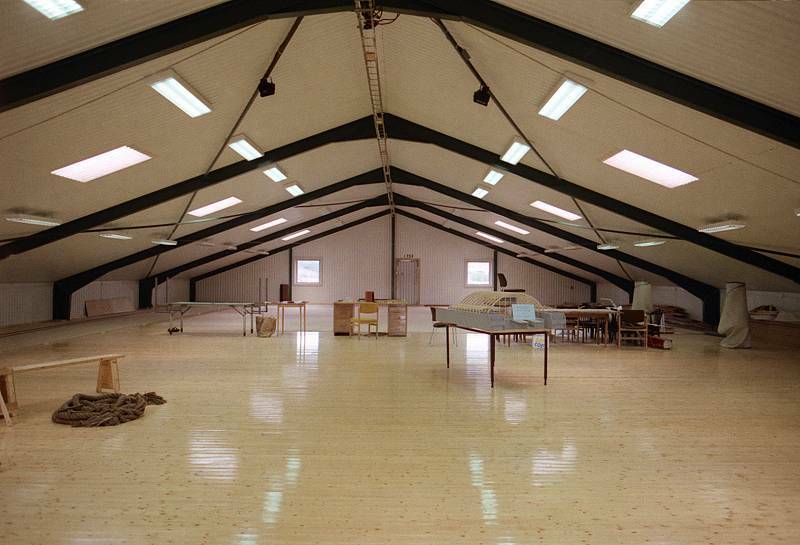 The "Hull Hall" - skrovhallen - was built on top of this from an old hall donated to us from I think The Gothenburg Harbour Co. It was just taken down, moved and rebuilt here. 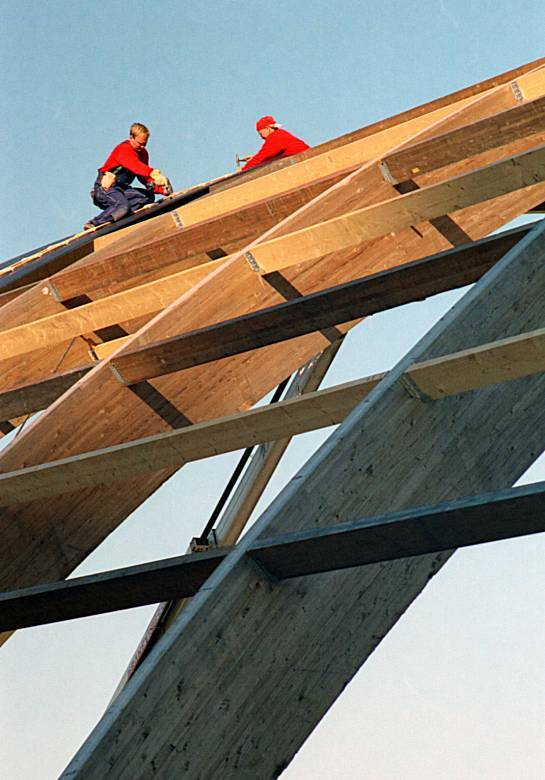 We only needed to cast new cement plinths for the beams, to arrive at the height we needed, and pay for having a new tin roof put on top of the old beams of the building. Very impressive and very functional. The least costly hull hall in the world history of shipyards I believe. View from the staircase leading down from the sail loft. 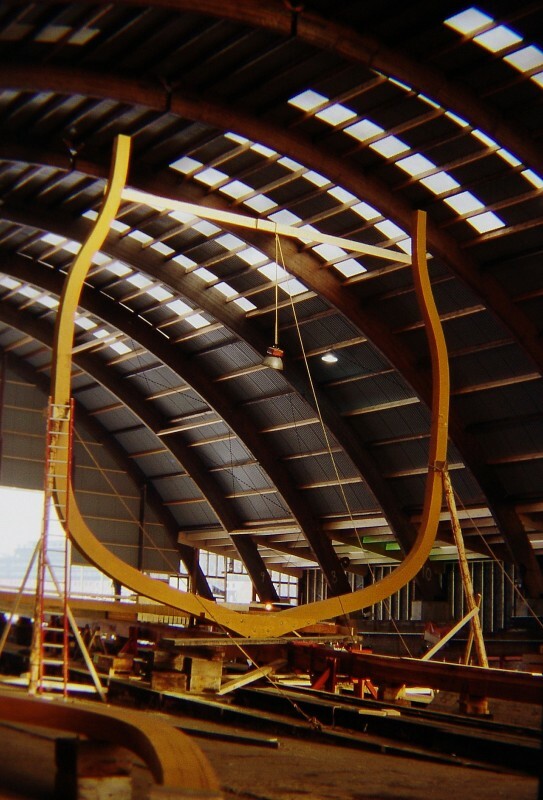 The 8th of December 1996 the first rib was officially raised and fastened to the keel. August 1998, two years later. 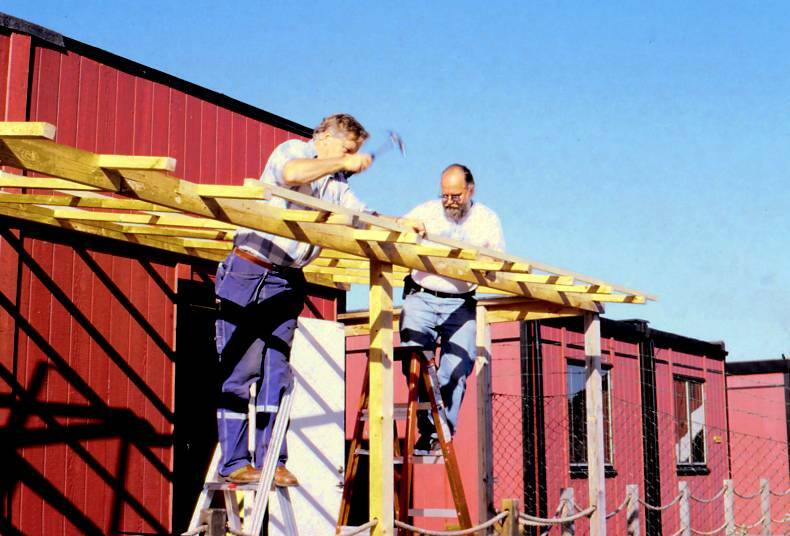 The skylights in the roof helped giving a magic sheen around the hull, reminding of the time when a hull like this would have been built outdoors under the open sky. 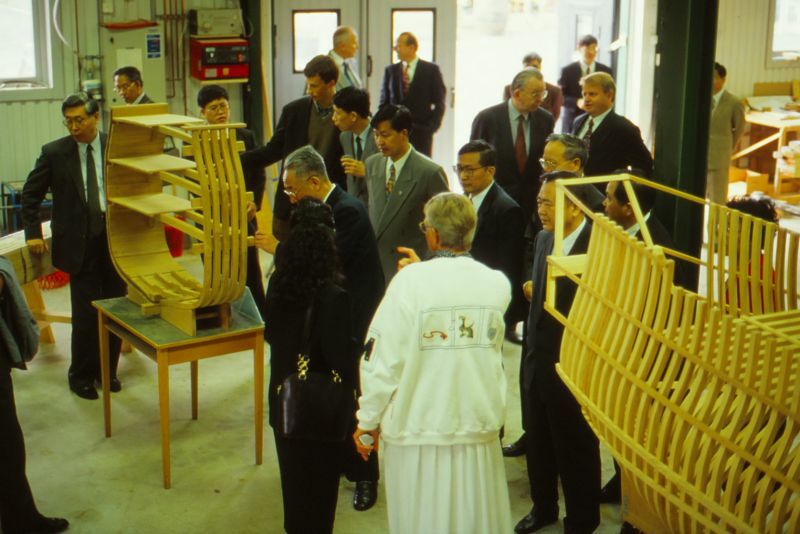 The project is now also firmly established as a part of Swedish-Chinese trade relations and Chinese official delegations make a point of regularly visiting the shipyard during their visits to Sweden. 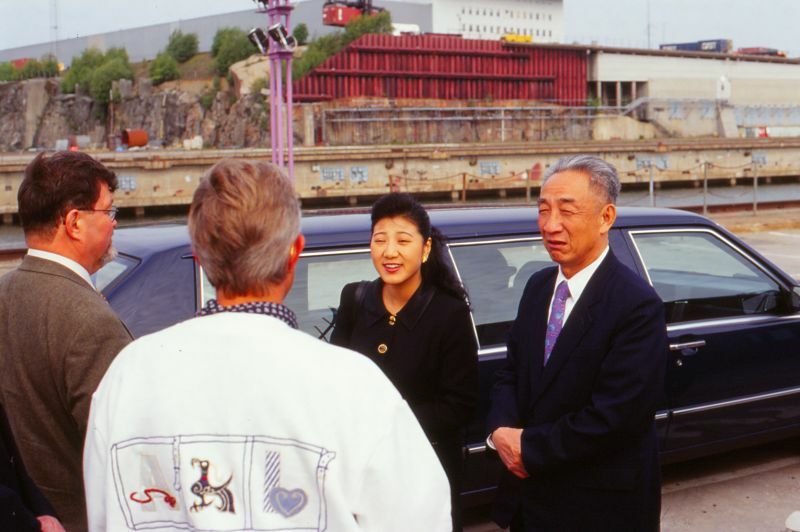 Among many visitors, the Vice premier of China, Zou Jiahua and the Major of Shanghai, Xu Kuangdi pays the shipyard a visit with them their Swedish entourage. 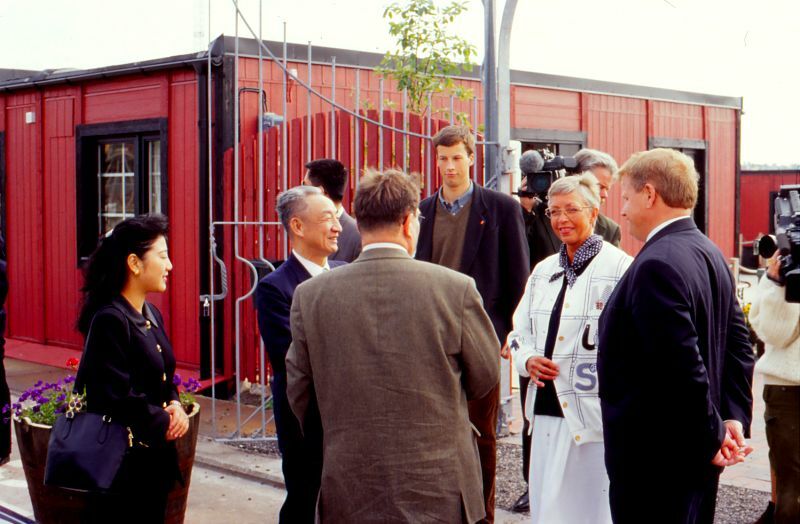 The 4th of June 1996 The shipyard is visited by the Vice Premier of China, Mr. Zou Jiahua together with the Chinese Ambassador to China, Mr. Yang Guirong and the Swedish Ambassador to China, Mr. Sven G. Linder Receiving the Vice Premier of China, Mr. Zou Jiahua, is to the left, the Major of Gothenburg, Lars-Åke Skager and in white jacket, Berit Wästfelt. Since very little of the actual ship was to be seen for a long time, models of what we were about to build needed to make do. 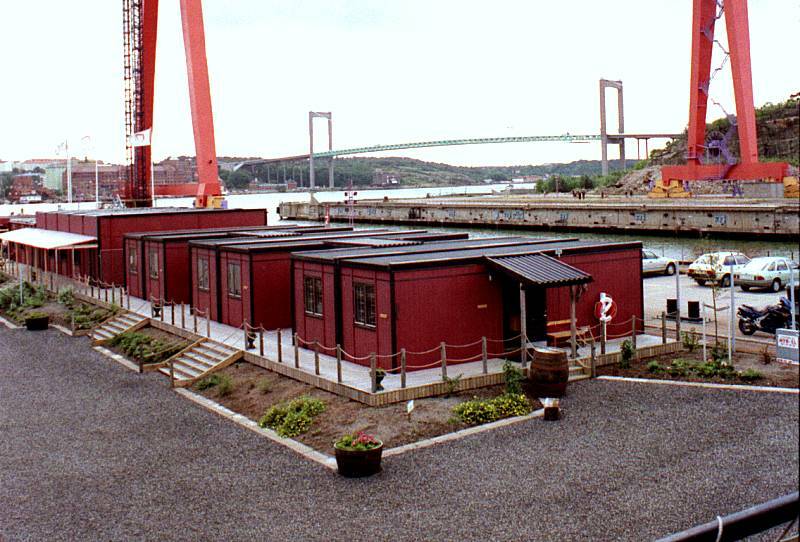 These models was also used at various exhibitions outside of the Shipyard, for example the yearly Båtmässan at Svenska Mässan. 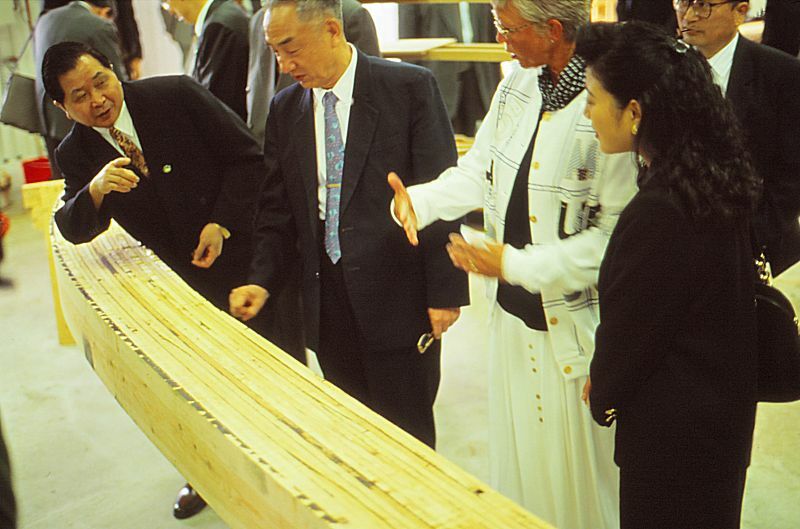 A rib under construction is shown to the Vice Premier of China, Mr. Zou Jiahua. The Gotheborg East Indiaman Project was now well under way to become the many faceted project is was intended as, working on a wide variety of levels locally and internationally, between Sweden and China. 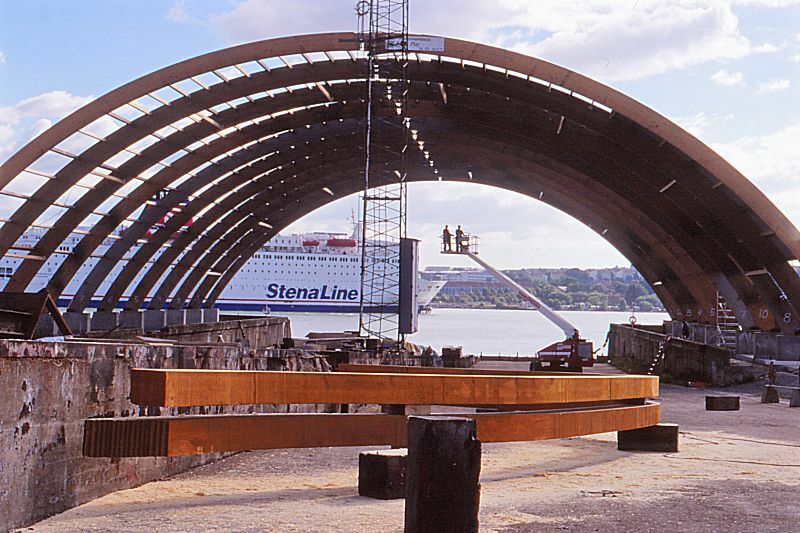 The ship building progresses according to plan and in September 1998 all ribs are in place. During the following six years the project matures into a more formal organization that focuses on building the ship leaving much of the old sponsors and initiators behind. In June 6, 2003 The new East Indiaman Götheborg is launched and further work is now made on a floating ship docked at quayside. Already in June 13, 2003, the first mast - the 23 meter long foremast - was fitted. In September 3, 2004, Her Majesty the Queen Silvia of Sweden performs the naming ceremony of the Swedish East Indiaman Götheborg and the next summer, in April 18, 2005, the first trial voyage ever with the new built ship takes place.